One of gaming's most immersive tactical shooters is getting more goodies over five years after launch. Bohemia Interactive has continued to bolster the Arma 3 experience with major updates, expansions, and fixes since launch. The studio doesn't seem to be slowing up any time soon, either. This week, the team revealed the roadmap for the rest of 2018 and beyond. 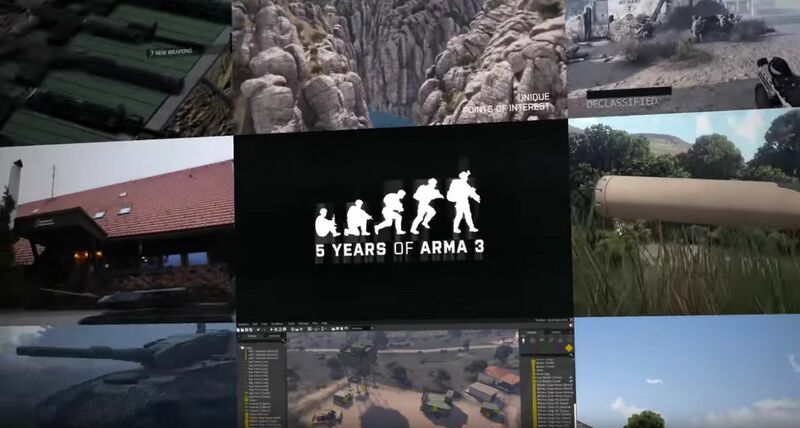 The retrospective above spotlights the many updates that have gone live for Arma 3 players since September 2012, including the Arma 3 Karts DLC, campaign episodes, and the massive Apex expansion from 2016. Next up for this military-based tactical simulation shooter is the Warlords update 1.86, which will close out 2018. Development of this new multiplayer mode has been going on the last few months, the team reveals in the Arma 3 blog post. "We believe it fills the gap in our current selection of official multiplayer modes by focusing more on large-scale combined arms warfare," the post reads. The mode started out as a creation of Arma 3's Senior Designer Josef "Chosé" Zemanek" and has been in the Steam Workshop since 2015. Details on the changes to Warlords will be revealed in a future Arma 3 blog post, but the 1.86 update will also include the ADR-97 weapon pack. It's an official mod now, meaning server hosts and creators can include it in arsenals without needing to worry about players having the Steam Workshop mod installed. The pack includes a collection of variants for the ADR-97 submachine gun, a lightweight firearm with a high rate of fire. The mod was originally made by Jakub Horyna, an Arma 3 programmer. Another bonus is the 1.86 Warlord update is the addition of five veteran Arma 3 developers as custom character heads: Jay “RoyaltyInExile” Crowe (ret. Creative Director), David “Dwarden” Foltýn (Technical Community Manager), Petr “Pettka” Kolář (former Project Lead), Vojtěch “Dr Hladík” Hladík (Lead Programmer), and Ivan Buchta (Creative Director). The 1.86 update doesn't have an exact release date yet, but is expected before 2018 ends. 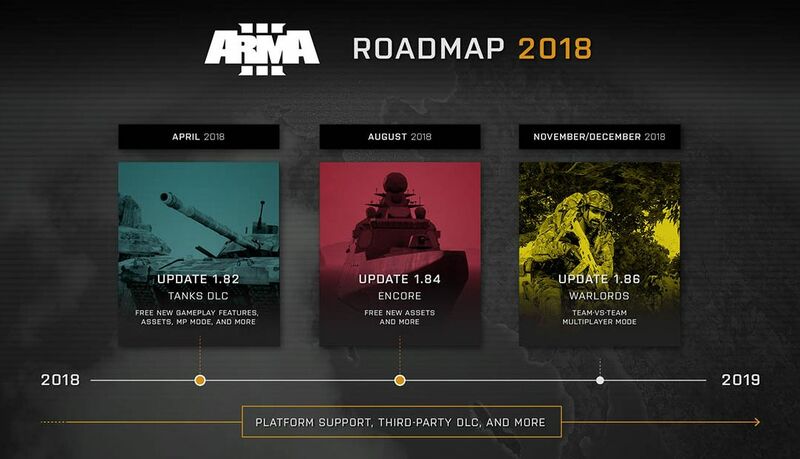 Lastly, Bohemia Interactive teased a few things coming to Arma 3 in 2019. The team that developed the Laws of War DLC, which featured the Remnants of War campaign where players played as IDAP explosive specialist Nathan MacDade, is now working on a new project. Other Bohemian teams are helping with the project as well. The studio says this DLC is built on the Arma 3 platform but "do something a bit...unusual." The team also expects to have the first project spawned from the company's third-party DLC initiative. This allows the team to move on to new projects while cultivating projects from dedicated creators. Arma 3 is available now on PC. Stay tuned to Shacknews for additional updates.